Dispatches from a dusty desert outpost called Utah. A little over a year ago I volunteered to serve on my city’s historic committee. It is an active group that has spent its 10+ years of existence putting up interpretive historic signage around the city, documenting historic structures, and producing a local history of the area. One common agenda item that has come up at multiple council meetings is what to do with the largest, and most historic, building in the city boundaries: the Old Mill. Cottonwood Heights is one of the more interesting suburbs of Salt Lake. The city itself is just over a decade old but the area was among the earliest explored and settled by the first Mormon settlers. Human activity is always tied to environmental opportunity, and modern day Cottonwood Heights is no different. It was a source of early interest to settlers due to the fact that it sits near the abundant water and timber resources of Big and Little Cottonwood Canyons. In 1883 the Mormon proprietors of the Deseret News began exploiting these water and wood resources to run a paper mill. 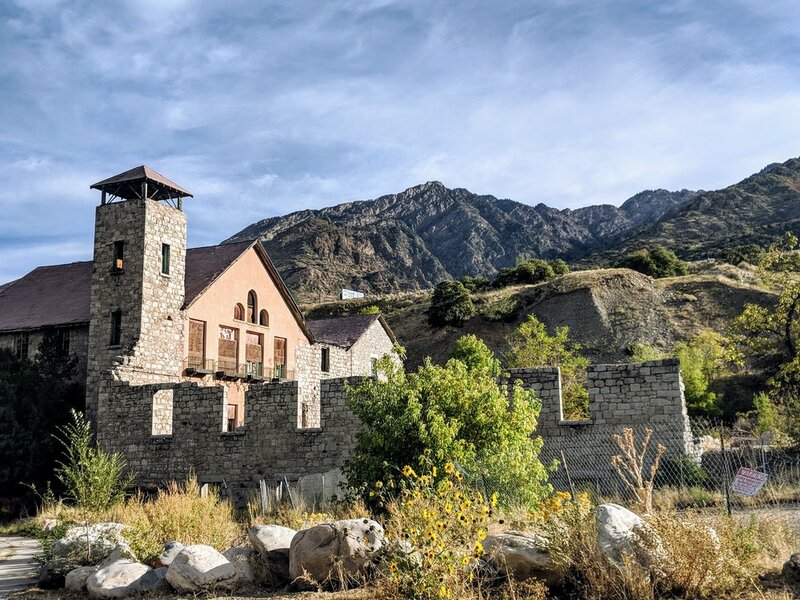 The mill produced pulp from rags and tress of the nearby canyon until 1892 when it caught on fire. The skeletal remains were rebuilt in the 1920’s to serve as an open-air dance hall. The building had a fitful history until it was ultimately condemned in 2005. In the ensuing years the Old Mill has served as the namesake for the massive housing development that has taken root along the east bench of the city. For a time it also spent every October being repurposed as a haunted house. I am old enough to remember October evenings of my early adolescence spent getting scared at the Old Mill. Knowing what I know now, I’m grateful the thing didn’t cave in on my friends and I. As far as I know, the Old Mill doesn’t have any proper ghosts tied to its history. Yet, its mere presence in the middle of an affluent suburb (near canyons that are now famed for their ski resorts) is more than a little haunting. I take my dogs on weekend walks past the Old Mill, and it does this horror-loving heart good to see a place where it feels like it’s Halloween every day. As I mentioned, the Cottonwood Heights Historic Committee discusses the place often. There is a deep desire to turn the most visible historic structure in the city into something more than a decrepit ruin. My hunch (based on the state of the place) is that it will stay empty and haunted until an event (be it time or a well-placed earthquake) brings the whole thing collapsing in on itself.